Victory! 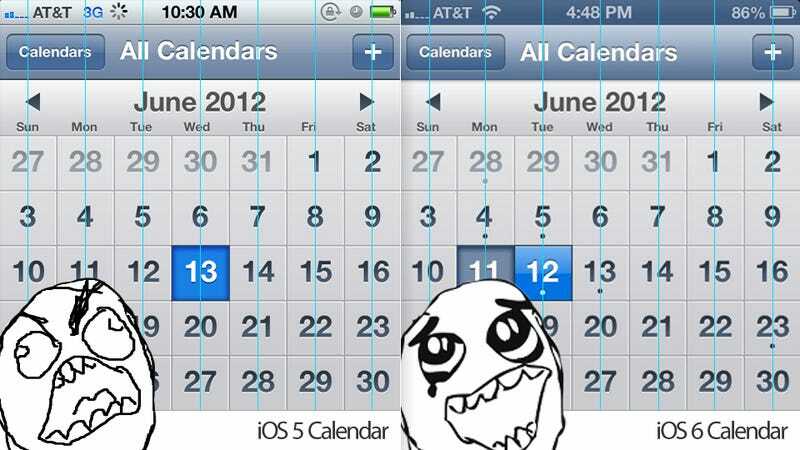 Apple has fixed the weekdays placement in iOS 6's Calendar app after we complained about it a few months ago. I'm not surprised, because it was so impossibly bad that it probably had Steve Jobs rolling in his grave. This user interface agression just couldn't stand, man. What the Hell Happened to Apple&apos;s Attention to Detail? But there are bad news, my fellow user interface and kerning fetishists: they haven't fixed THE BLOODY OFF-CENTER NUMBER 1 IN THE CALENDAR ICON in iOS 6. It's still using absolute centering instead of optical. Have you noticed any cool user interface details in iOS 6? Contact me via email.